Cyril Huze grew up in Paris, France. At the age of 18, he left home to stake his independence. He self-funded his higher education and earned a masters in marketing. At age 24, he starts gaining experience working for American advertising agencies based in Paris handling accounts for Schweppes, BP Oils, BMW cars. By his 30s, he had already started his own ad agency and was chosen to handle the national advertising accounts for McDonald’s, Volkswagen, 3M, Hertz, among others. Cyril art directed and wrote copy for all his own campaigns and made a name for himself by winning advertising awards and having his work published in hard cover books and exhibited at the museum of advertising. By the mid-80s, a passion for America had grown so strong that Cyril willfully abandoned his successful career to make the United States his home, proclaiming “Life’s too short not to live your dreams.” As quickly as he could, he seals his new life by choosing to become a naturalized US citizen. In the nineties, his passion for Harley-Davidson grew stronger than everything else in his life and he decided to enter the business of building motorcycles. Like most builders, Cyril started by customizing his motorcycles and his friends’; it was more as a hobby than as a profession. 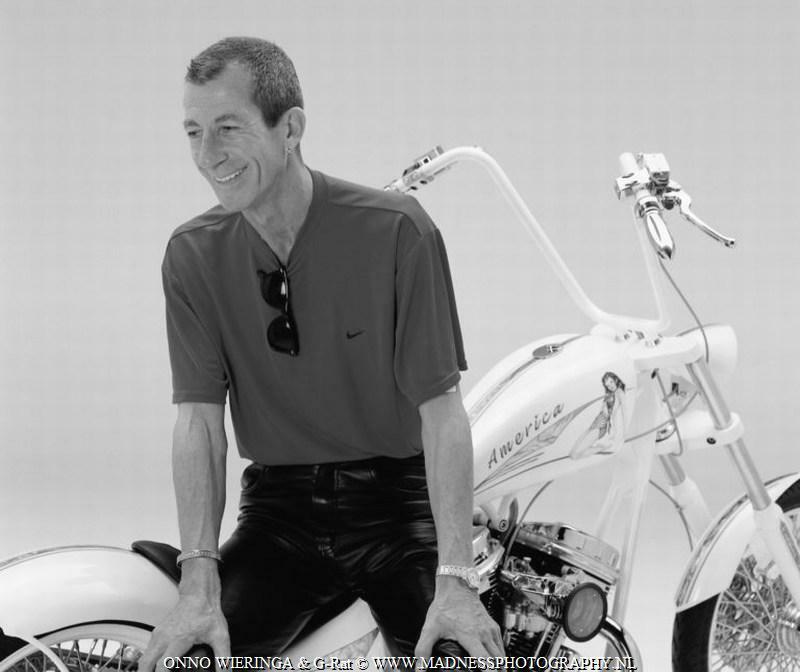 All his custom motorcycles went on to beat the pros several years in a row in Daytona and Sturgis with memorable custom motorcycles: “Deanager”, “Harley Davidstones”, “Glamour Girl”, “Blues Brothers”, “America”, “Graffiti” etc… His first client gives him a huge budget for the time to build him three motorcycles. Because of Cyril’s unique style and attention to detail, his motorcycles get featured all over the world. By the turn of the millennium, the industry had acknowledged him as a Master Builder. With a looming recession in the US that would start reeling the business of custom motorcycle building, Cyril recognizes the huge influence of the internet in our daily lives. He sees a business opportunity to offer custom motorcycles news in an intimate digital format. In 2006, the daily “Cyril Huze Post” was born. Determined to continue making his passion financially viable, his online publication becomes profitable within the first year. For the next 12 years, his work took him on travels across the US and abroad, covering the industry and sharing the passion of custom motorcycles with an online community across the world. Cyril Huze passed on May 20th 2018 at his home in Boca Raton, Florida. He was buried in the strictest intimacy. A mass to celebrate his life will be held in Versailles, France on June 24th, 2018.